Luxor Linens Sheets Review - How Do These Bamboo Sheets Feel? If you find that you’re all squared away with a complete collection of classic bedding essentials, you might be in search of something a little more luxurious. Luxor Linens designs luxury bedding for folks who are looking for something a bit more special than plain, white cotton. 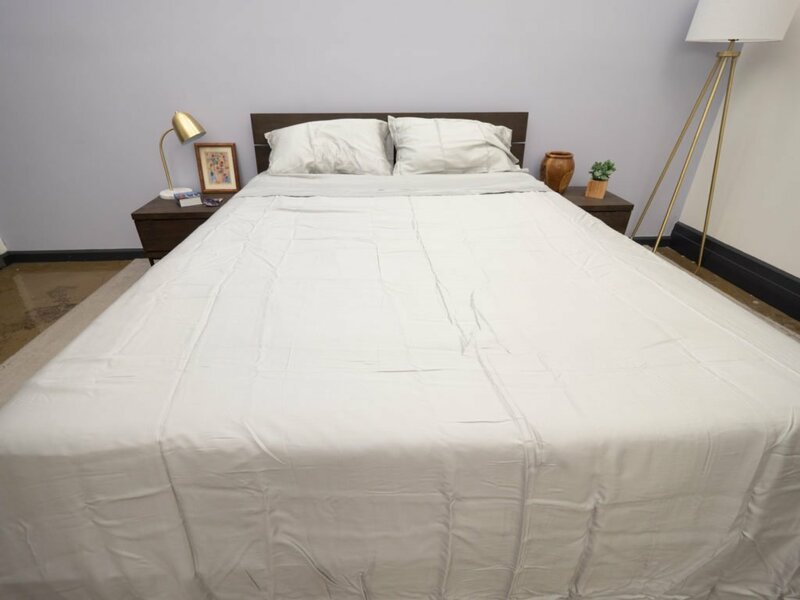 So, Sleepopolis is here to examine Luxor Linen’s Delano Organic Sheet Set to help you determine if this shiny, bamboo-based bedding is the boost your bedroom has been waiting for. 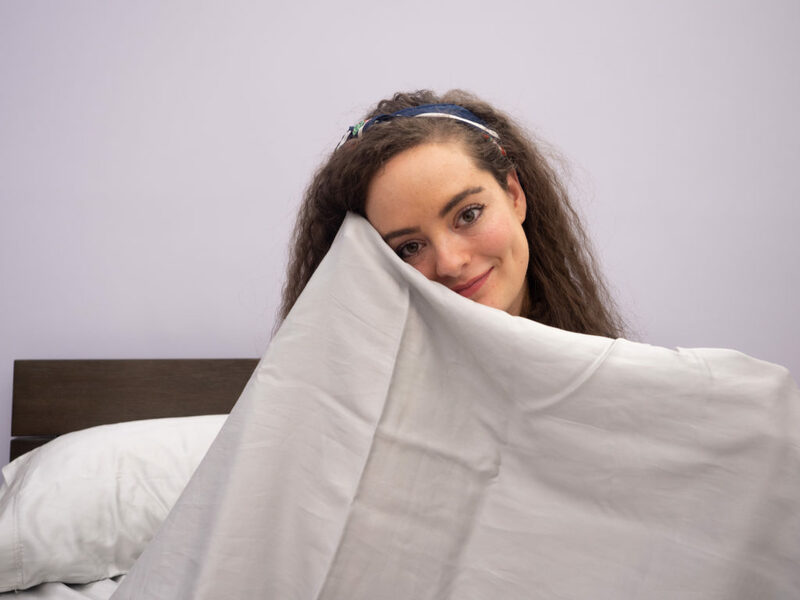 In this review, I’m going to take you through what these sheets are made of, how they feel, and my personal opinions about them so that you can decide if this bedding is worth a try! Click here to skip to the review summary. Use SLEEPOPOLIS25 to save 25% and burrow into the luxuriously silky feel of Luxor Linen's sheets! Each Delano Organic Sheet Set comes complete with one top sheet, one fitted sheet, and two pillowcases. The pillowcases open on the side, but do not offer envelope closures (that little flap of fabric that hides the pillow inside). 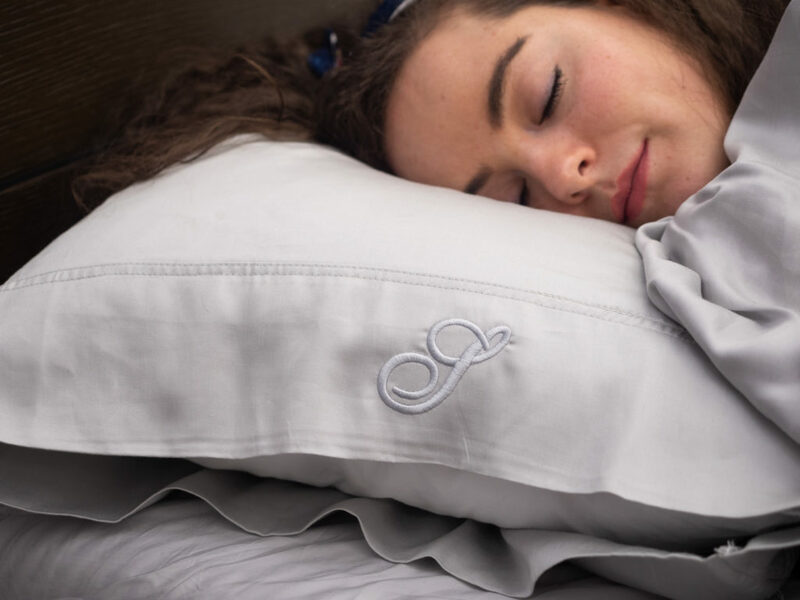 However, the sheet set I’m testing does feature the brand’s signature “L” monogram in silver stitching (which is a nice touch, in my opinion!). The fitted sheet is capable of accommodating mattresses up to 18 inches deep which means very deep pockets. So, if you’ve got a mattress that’s on the taller side, these sheets might be particularly beneficial for you. These sheets are made from a blend of bamboo and organic Egyptian cotton which is intended to offer a super soft and sumptuous handfeel. They are sateen woven which gives them a lustrous sheen, and enhances the smoothness of the fabric as well. So, my first impression of these sheets is that they look and feel quite silky. Both Egyptian cotton and fabric derived from bamboo each come with their own special set of perks. Some benefits of bamboo-based bedding include moisture-wicking ability, antimicrobial properties, and better breathability. 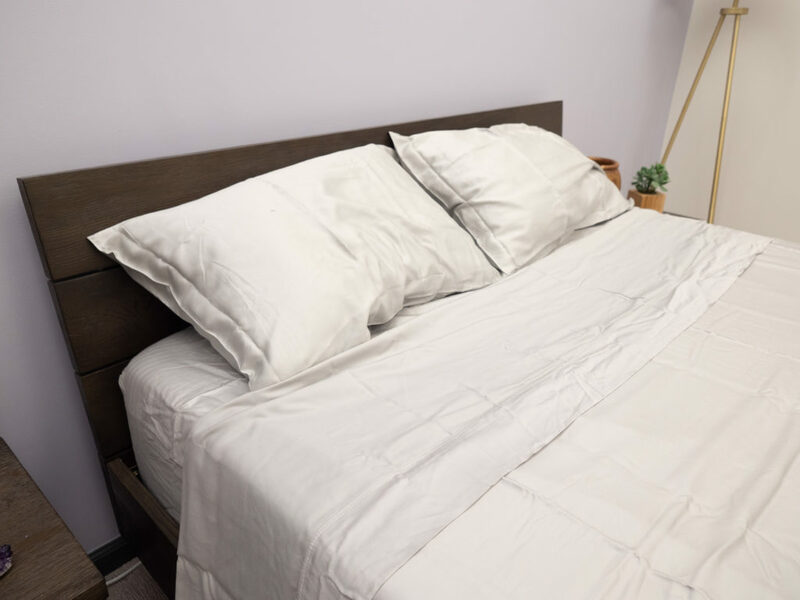 Additionally, many folks prefer bamboo bedding because bamboo is a fast-growing, sustainable resource which brings a nice eco-friendly element to the table. Meanwhile, Egyptian cotton is often considered to be a higher quality of cotton thanks to its extra long and durable fibers. Longer, finer cotton staples typically make for a very soft handfeel, and they also boost breathability. 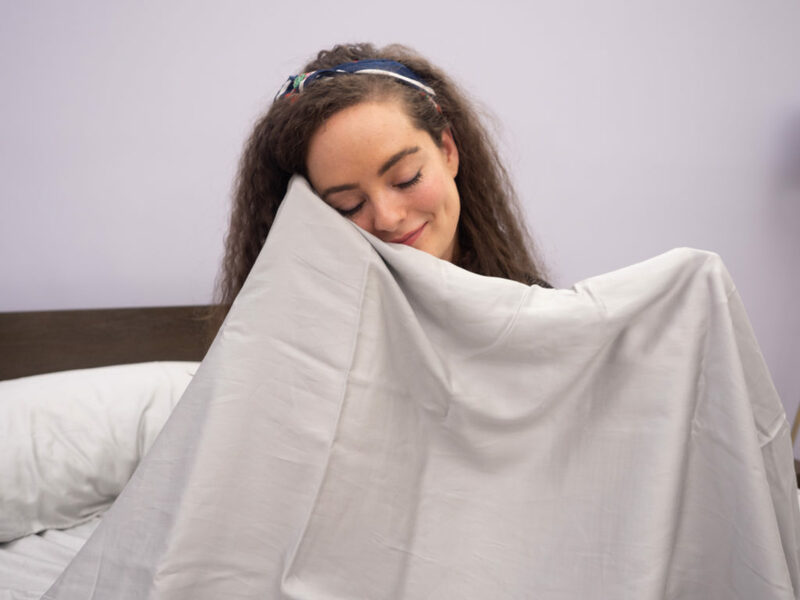 So, the folks at Luxor Linens say that by combining bamboo with Egyptian cotton, sleepers can enjoy a “lusciously soft, eco-friendly” set of sheets. This particular sheet set only comes in one color (grey), though sleepers are given the option to choose a monogram for the pillowcases. You don’t have to choose a monogram, but if you do, you can choose Luxor Linen’s signature “L”, or customize it with your own initials. In my opinion, the lustrous sheen, silky feel, and custom monogram, all contribute to the luxurious nature of these sheets. The sateen weave, bamboo fibers, and Egyptian cotton combine to create a very silky handfeel. 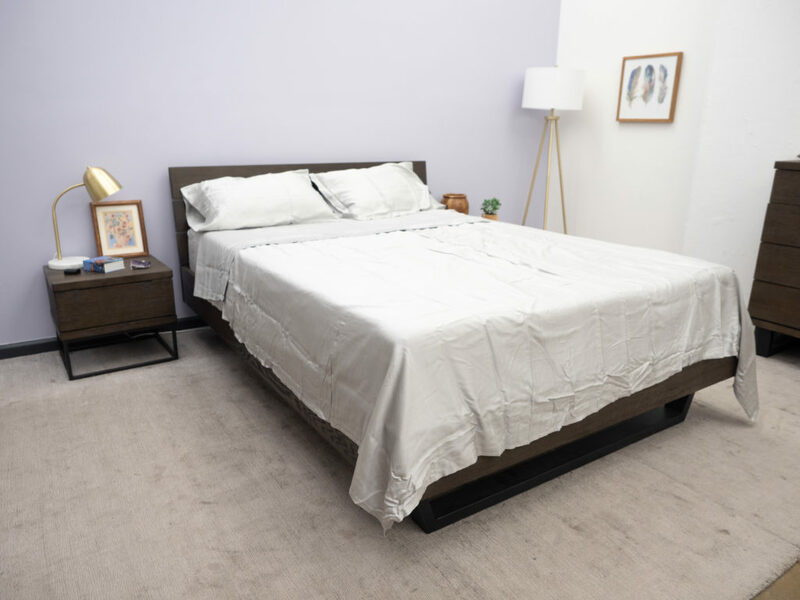 Though a sateen weave usually produces a thicker sheet than a percale weave, the bamboo is working to keep these sheets feeling light and airy. So, when you first dress your mattress with these sheets, you’ll notice that they feel cool, breathable, and buttery-smooth. While these sheets are lighter in weight than other sateen woven sheets I’ve tested, they definitely fall in line with some other traits that are characteristic of this weave style. For example, they are silky to the touch, have a very lustrous sheen, and offer a body-conforming drape. They don’t offer that crisp, button-down-shirt feel that often comes with cotton percale. Instead, they feel more like satin and drape over your body’s form in a way that accentuates the sheen and silhouettes your shape. They also feel quite breathable and moisture-wicking which might be particularly beneficial to sleepers who run hot. As is often the case with bamboo bedding, these sheets wrinkle quite easily. Unfortunately, the wrinkling is sort of highlighted by the fabric’s lustrous sheen. The wrinkles don’t detract from the softness of the sheets, but you can feel them as you rub your skin over the material. Overall, these sheets offer a luxuriously silky feel with light breathability. Sleepers who like the smooth feel and elegant drape of sateen, but also prioritize cooling properties, might want to give this sheet set a try. I’ll admit: Bamboo, Egyptian cotton, and sateen are some bedding buzzwords for me. I love the cooling smoothness of bamboo, the soft durability of Egyptian cotton, and the lustrous sheen of sateen. So, I had an inkling that I would like these sheets before I even opened the packaging. And while I did enjoy those particular traits, there were a couple things about this bedding that I wasn’t so crazy about. When I first dressed the mattress with this sheet set, the first thing I noticed was how luxurious they look. They’ve got this really pretty sheen that’s accentuated by how softly the fabric drapes over the bed and pillows. 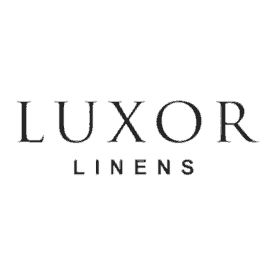 The second thing I noticed was that the color of these sheets does not exactly match the color represented on Luxor Linen’s website. On the website, the sheets are shown to be a darker grey color when, it reality, they are much closer to light silver. Personally, I found the silvery color to be nicer than what is shown on the website, but it’s still worth noting that there is some disparity between colors. As I crawled into bed and billowed the top sheet over my body, I could feel the air flowing through the fabric — and it cooled me down. In my experience, it is often the case that sateen woven sheets lie heavy on the body and are less breathable. But these are among the most breathable sateen cotton sheets I’ve ever tested. Rolling around in bed, I was really enjoying the silky, cooling comfort of these sheets. I could definitely feel the airy, smooth qualities of bamboo at play (which is great because it is not always the case that bamboo-derived fabric will adopt the beneficial properties of the plant itself). As I suspected, the Egyptian cotton and bamboo seemed to blend in a very comforting way. Not to mention, I did kind of feel like I was in my own fancy hotel bed. To me, the lustrous, silvery sheen and satin-like feel of this bedding gives off a rather luxurious vibe. I think the monogrammed pillowcases are a nice touch too. However, these are also some of the wrinkliest sheets I’ve tested! I know that bamboo-based bedding has a tendency to wrinkle easily, but these were very wrinkled by the time I even removed them from the packaging. Additionally, the lustrous sheen seemed to highlight the wrinkles, which really made them stand out. Luckily, these sheets are machine dryable, so I suggest pulling them out of the dryer as soon as the cycle is finished so you can spread them out over your mattress when they are still warm and wrinkle-free. While the wrinkles were not enough to distract me from the luxurious feel of these Luxor Linens, there was one thing that did worry me a bit. When it comes to finding my perfect bedding, one thing that’s kind of a deal breaker is an ill-fitting fitted sheet. And I’m not sure if it was the silky, slippery nature of the fabric, the extra deep pockets, a loose elastic band, or a combination of the three — but this fitted sheet did not fit the mattress well at all. For this review, I was using a mattress that’s about 12 inches deep, so I tucked the excess fabric under the mattress for a snug fit. Usually, this is enough to keep the fitted sheet tightly tucked beneath the mattress. However, with this particular fitted sheet, there was a lot of gapping and excess, baggy material bunching up on top of the mattress. I’m a bit of a restless combo sleeper, so I need to know that my fitted sheet is going to stay put despite my tossing and turning. And while the Delano fitted sheet never came completely untucked from the mattress, it did slide up around the sides quite a bit. Ultimately, I found the loose, baggy nature of the fitted sheet to be this bedding’s biggest drawback. Ultimately, though, I did enjoy this bedding a lot. With its silky feel, superior breathability, and lustrous sheen, I would definitely place it in the luxury bedding category. Aside from the wrinkles and the baggy fitted sheet, there was very little I didn’t like about this sheet set. The Verdict: I extend my most enthusiastic recommendation to sateen-loving folks who sleep warm, and are looking to boost their collection of luxury bedding. ARE LUXOR LINENS SHEETS WORTH THE MONEY? Sleeps Warm — These sheets feel silky smooth to the touch, but they are also very breathable and light. I really felt like these sheets did a good job of keeping me cool, which is always a priority for a hot sleeper like me. So, if you’re also a hot sleeper, you might want to give these sheets a try. Loves the Luster — Folks who love a lustrous sateen sheen will probably love the silvery shine of these sheets. Not to mention, the monogrammed pillowcases add a luxurious aesthetic that, personally, I find to be quite charming. Isn’t Quite Sure — Luxor Linens offers sleepers a trial period of 90 days. So, if you’re not sure this bedding is the right fit for you, just try it out first! If you don’t love it, you can easily have it refunded or exchanged. Wrinkly — I’m afraid that wrinkles often accompany with bamboo bedding, but I did find these to be particularly wrinkly. Luckily, they are machine wash and dryable so if I were you, I’d pull these sheets out of the dry cycle as soon as it’s finished so that you can spread them out over the mattress when they are still warm. This should serve to keep the wrinkles at bay. One Color Option — I do love this silvery color, but some sleepers might want a different color option. Unfortunately, there is only one color option with the Delano sheet set. Not to mention, the color of these sheets doesn’t really match up with the color presented on the website. So, while I’m very pleased with how these look, I did find that to be a little misleading. 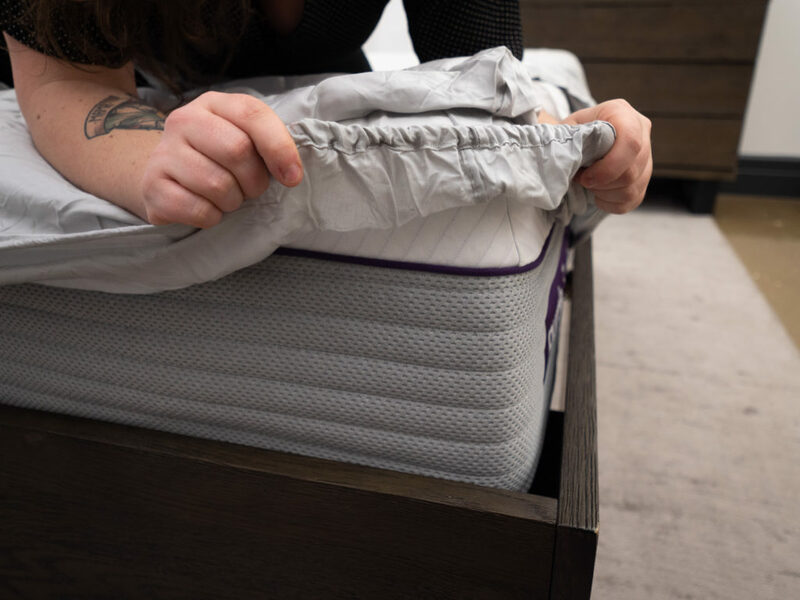 Baggy Fitted Sheet — In my experience testing these sheets, the fitted sheet slipped up the sides of the bed, creating gapping between the fabric and the mattress. I found the fitted sheet to hang loosely on the mattress, and to me, this is rather uncomfortable.